DETROIT – The first 40 minutes didn’t go very well for the Red Wings. Things changed in a hurry in the third, however. 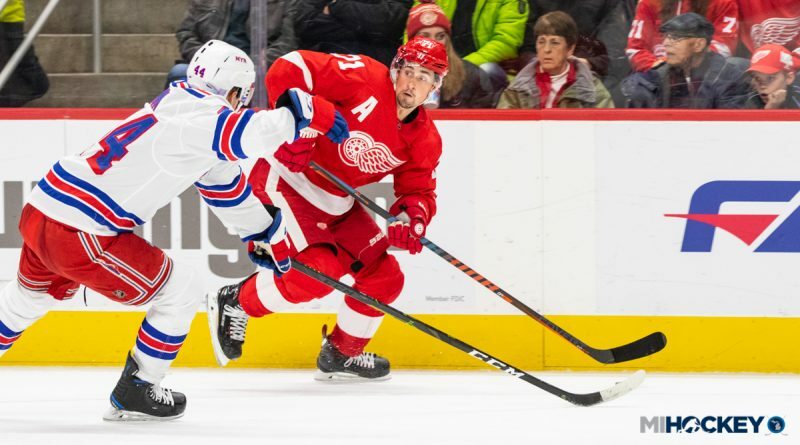 Justin Abdelkader and Andreas Athanasiou scored in the final period of regulation to force a 2-2 tie with the New York Rangers Friday evening at Little Caesars Arena, and Dylan Larkin finished things off in overtime. The Wings are now 6-8-2 on the season; Detroit has now won five of its last six games. Jimmy Howard stopped 28 of the 30 shots sent his way to be named the game’s first star. The two Original Six foes played to a scoreless first period; New York claimed a 2-0 lead in the final three minutes of the middle frame on goals from Kevin Shattenkirk and Neal Pionk. Abdelkader cut the deficit in half 1:46 into the third period with some help from Gustav Nyquist. Athanasiou tied the contest with 2:02 remaining in regulation. Stay tuned for some photos from the game, as well.